Microdialysis cerebral technique has been widely employed in order to study neurotransmitter release. This technique presents numerous advantages such as it allows work with sample in vivo from freely moving animals. Different drugs in different points implanted probes in several brain areas can be infused simultaneously by means of microdialysis. Parkinson’s disease (PD) is a progressive neurodegenerative disorder that is primarily characterized by the degeneration of dopamine (DA) neurons in the nigrostriatal system, which in turn produces profound neurochemical changes within the basal ganglia, representing the neural substrate for Parkinsonian motor symptoms. Over the years, a broad variety of experimental models of the disease have been developed and applied in diverse animal species. The two most common toxin models used employ 6-hydroxydopamine (6-OHDA) and the 1-methyl-4-phenyl-1,2,3,6-tetrahydropyridine/1-methyl-4-phenilpyridinium ion (MPTP/MPP+), either given systemically or locally applied into the nigrostriatal pathway, to resemble PD features in animals. Both neurotoxins selectively and rapidly destroy catecholaminergic neurons, although with different mechanisms. 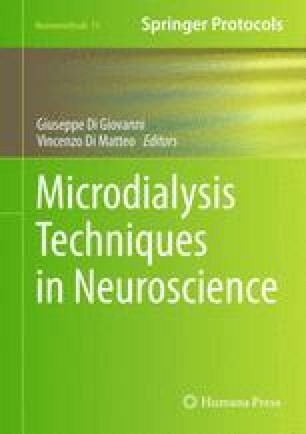 Since in vivo microdialysis coupled to high-performance liquid chromatography (HPLC) is an established technique for studying physiological, pharmacological, and pathological changes of a wide range of low molecular weight substances in the brain extracellular fluid, here we describe a rapid and simple microdialysis technique that allows the direct quantitative study of the damage produced by 6-OHDA and MPP+ toxins on dopaminergic (DAergic) striatal terminals of rat brain. Authors are indebted to the EU COST Action CM1103 “Structure-based drug design for diagnosis and treatment of neurological diseases: dissecting and modulating complex function in the monoaminergic systems of the brain” for supporting our international collaboration.